There are a number of segments within the maritime niche that have been well targeted by satellite vendors and these segments are now effectively saturated. These include cruise lines, oil & gas supply, and ferries. These sub segments are small in volume  less than 1,000 ships in total  but high in value. The related market in the oil & gas business includes supply vessels, drill ships, seismic vessels, and dive support services, so you can see why such should be included in the maritime market segment. CapRock, Stratos, and Schlumberger (the latter two companies are both Parallel customers) all have sizeable customer bases in this area. However, recent changes in the demand for broadband at sea has increased the number of operators deploying stabilized antenna systems. These operators range from a handful of specialized companies to more than 90 service providers located across the globe. All are interested in providing some form of VSAT service to the maritime industry. The past four years have seen major penetrations into the next levels of the market. These are comprised of several sub-segments, regional and international in scope. There has been a fundamental change in the wider commercial market as they start to recognize broadband at sea as an essential requirement. Most stabilized antenna VSAT services have experienced long term revenue growth at rates of between 15-20 per cent per year over the past five years. Underlying this, the customer base has considerably broadened. Average prices or margins are not as high today as they were in the late 1990s and early 2000s. Of the top 12 revenue earners in this segment, six have businesses primarily focused on the oil & gas industry. With the increasing saturation of this segment, many major players have progressively moved towards the broader maritime industry in their search for growth in vertical markets they know and within which they have developed substantial expertise. 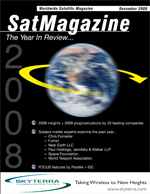 Despite the reduction in average pricing, revenues from stabilized VSAT services (which include bundled hardware) grew to more than $600 million in 2007. Vessels in service increased to more than 5,000 in number. The COMSYS Maritime VSAT Report analyses the total available maritime market based on their own primary research, publicly available data, specific data points from industry contacts, and specifically commissioned research by maritime industry consultants. The report reveals there are almost 150,000 vessels of all types. More than 20 per cent of these vessels are potential customers for VSAT. The segmentation of these vessels can be seen in the pie chart. For many years, communication at sea has been expensive and generally considered a luxury. Use of service has, as a consequence, been carefully monitored and controlled. Today, flat-rate broadband connectivity is becoming a necessity in order to recruit and retain crew. This has quickly strengthened the case for VSAT as an alternative to the established maritime satellite services that have dominated to date. To become successful in the Maritime industry, a satellite communications strategy was required that offered key differentiations from the other companies in, or aiming at, this market segment. For Parallel, a Maritime specific module with demonstrable ROI was built and added to the companys SatManage product. The aim was to achieve a 40 percent market share by the close of FY2010. The key module of SatManage is Location Tracker. A customer can easily determine where the mobile terminals have been located, where they are heading, as well as obtain a graphic view of each terminals current status (red/green up/down). The latter data is equally useful for static assets. Pop-up panels (screen shown below) reveal the location and heading of terminals at regular time intervals. Information pop-ups include all-important live and historical indicators, including lat/long data, RF and IP performance. The modules built-in database tracks out-of-transmission coastal areas or embargo areas. When a mobile VSAT terminal enters one of these areas, SatManage can raise a variety of alerts. Available in 2D and 3D interactive versions, SatManage allows for the real time overlay of external data sources including weather, radar, roadmap, satellite footprint, embargo areas, and imagery or custom overlays. Many Maritime Operators will require the services of several satellite providers, an added complication when compared to static sites. Crossing satellite boundaries from one provider to another must be carefully managed  connectivity must be maintained. SatManage allows Operators to monitor the vessels heading and to instantly determine when it would be sensible to transition to another provider. Another complication of having moving assets (especially for sea going vessels) is the requirement for the services of several Hubs and, with that, several Network Management System (NMS). Running a simple report for a vessel can require the Service provider to extract data from the various NMS of the various Hub Operators. This results in many hours of work to produce what should have been the simplest of reports. In addition, the Operator no longer needs to know which providers NMS is required for system configuration, commissioning, and so on. SatManage seamlessly launches the right tool for the project by selecting the appropriate application. All of these actions are handled from within a secure web portal. One of the primary factors driving shipping companies towards VSAT services as a more economical alternative to satellite phones is crew welfare. The SatManage INTRA probe can be setup for reporting on a per service level. This means the services that improve crew welfare can be carefully managed on a per service basis. The probe works at a low level and provides data on all IP information, including VLAN traffic. The crews ability to access the Internet and remain in touch with family on shore plays a major role in staff retention. With Location Tracker, families can be authorized for read only access  theyll be able to see where their loved ones are located and know when to prepare for their return home. Ship Equip is one of the fastest growing iDirect users in the shipping industry and has become the second largest maritime satellite communications operator (in terms of the number of vessels under contract) in less than four years after entering the business. They provide services on the iDirect platform as a Virtual Network Operator (VNO) and offer full, global coverage via several hubs, including Arqiva (U.K.) and Intelsat. Ship Equip recognized that to fulfill their growing business, they required increased resources. They searched for a solution to minimize resource requirements without impeding contract fulfillment and revenue growth. SatManage assisted with this need, by acting as a manager of managers, integrating all existing tools and vendors across the entire Network Operations Centre into one fully automated umbrella system, or portal. This significantly reduced operating manhours and added desirable features. One of the key issues facing Ship Equip was their use of services on multiple satellites, each with its own iDirect NMS. Preparing a report to view the number of active iDirect sites meant manually collating data from each NMS  this could necessitate two days of work. SatManage works with iDirect systems directly out of the box and makes all reports instantly, available all of the time, no matter how many NMS are in use or what the versions mix. This is extremely important to companies such as Ship Equip, who use the services of several bandwidth providers with a number of mixed iDirect NMS versions. SatManage provides a consolidated, agnostic view of the entire global network infrastructure. These capabilities help Ship Equip achieve their growth strategy with greatly reduced human resource requirements. SatManage will enable Ship Equip to reduce internal running costs through the advanced automation that it provides. Our customers can expect to see an improvement on what is already a class leading quality of service. We are the best in the industry and SatManage will enable us to extend that lead.